Another batch of White Death is on the way! This beer was brewed on 01/03/15. I had posted my last take on this recipe in the fall, and had said there wasn’t anything I’d change. In the time since that post, I drank a whole bunch of Heady Topper, and wow that beer is just crazy good. White Death, while not supposed to be a direct Heady clone, was always intended to be in the ballpark, and my last batch came close. However, after having a case of Heady at my house I realized my White Death wasn’t quite 100% where I wanted it. The flavors are there, but I wanted a touch more bitterness, and to try and get that great drinkability that Heady Topper has. With those goals in mind, I made a couple of changes to the recipe. First, this is a 3 gallon batch! So if you’re reading this (There’s bound to be one or two of you right?) and thinking of brewing this beer, I just cut everything in half from my normal batch size. I’ll talk about why I did a small batch in a bit. Downing a can of Heady is an easy thing to do. The beer is bitter, but it doesn’t linger on your palate and leaves you wanting more. The beer is dry, but still had a nice mouthfeel. In an attempt to emulate this drinkablity, I dropped the oats and caramalt from the recipe, and hope that the grainy bread like flavors from the Pearl malt and White Wheat will be enough of a malt backbone. I feel like the caramalt was used in such low quantity that it shouldn’t be missed here anyway. I also mashed a bit lower this time, 150 degrees for an hour. Another change I made was the addition of Mosaic hops, and the subtraction of Amarillo. I like Amarillo hops ok, but I haven’t really been blown away by them, while I have really enjoyed everything I’ve had that makes big use of Mosaic. Even having Heady, which as far as I know doesn’t have Mosaic hops, there are aromas and flavors that remind me of Mosaic, and nothing that really struck me as Amarillo. My LHBS doesn’t have hop extract, so I went back to bittering with Apollo for this one. I also tried adding more gypsum to this batch than I’ve ever used before. As far as why I did a small batch? I still have about 6 bottles of my old batch in the fridge. They have not held up well. 6 gallons of a beer that is best fresh was too much, especially since I had several other brews ready at that time too. I had about a case left when I could see the beer darken some and the hops started fading. The beer is now a shadow of what it was fresh, a dull copper as opposed the the bright golden orange it was. I’d rather brew just a case and love every sip, rather than brew two cases and have to power through the last 12 packs worth that’s gone south. Hopefully when I get a keg system eventually this concern will be a thing of the past since I’ll be able to purge everything with C02 to minimize oxidation. I did this brew as the first half of my two batch stove top brew day. The brew day itself was uneventful, which is usually a good thing. It was just me and the dog, so I wasn’t distracted, and kept the beers to a minimum (Boooooooo!). I mashed in at 150 for an hour, sparged, and boiled. I did an hour long hop steep. I put half my flameout hops in immediately after the boil, and added the other half for the 30 minutes it was cooling. I had to do an ice bath for this one since my chiller is set up for a garden hose attachment, and it was snowing out so I didn’t feel like dealing with that. I took my hydrometer reading and it came in at 1.073, right around where I wanted it. Bottling Update on 01/17/15: FG of the beer was 1.012, right where I wanted it. The hydrometer sample tasted and smelled amazing. It really did remind me a ton of Heady Topper, and while I may not have been going for an exact clone, this tasted damn close. The only negative here was I only got 21 bottles from this batch. I took the siphon out as soon as I started getting some hop material up with the beer. I left what was probably another few bottles worth in the carboy, but with all that hop material from the huge dry hop, I didn’t want to risk sucking that into the bottling bucket or agitating the beer. Tasting Notes on 01/25/15: I feel that this beer is best to drink as soon as its carbonated, so this was about a week after bottling. This beer is great, plain and simple, and I feel it’s most likely the best beer I make. This third batch is even better than the last one, and the subtle changes from the lat batch are the difference. Appearance: This beer pours a very hazy golden orange color, almost like a glass of orange juice. The beer pours with a fluffy white head that slowly dissipated into a consistent thin head that lasted the whole glass. The brew left nice lacing on the glass. Exactly how I like my IPAs to look. Smell: Huge hop aroma on this beer, complimented by the Conan yeast. I get aromas of pineapple, passion fruit, some pine, earthy dankness, citrus, and a nice dose of peach from the yeast. Huge aromatics on this one. Taste: There’s a nice bitterness upfront, but it quickly gives way to waves of hop flavors. The tastes largely follow the nose with some tropical fruits and earthiness. I get a lot of pineapple and some citrus and some peach. The back end has a nice sweetness to it. I’m glad I dropped the oats and caramalt, the Pearl and White Wheat provide enough base to give the beer a nice malt base to let the hops play on. Mouthfeel: I was worried that cutting the oats and caramalt would have a negative effect here, but thankfully I was wrong. The beer is a just slightly drier, but it’s definitely more drinkable than the last batch. As a matter of fact, this beer is dangerously drinkable for an 8% beer. The mouthfeel is still sturdy enough to keep the beer from ever feeling thin. Overall: This is as good as any commercial IPA I’ve had in my opinion, and as a very Heady Topper like flavor to it, but not close enough that it would be a clone, which is fine. I like what the Mosaic hops added here, and I can detect their presence in the beer, where I feel like the Amarillo in the previous batches got lost in the shuffle. The beer didn’t lose anything from simplifying the malt bill, and I think it was an improvement. I love this beer, and the only way I feel it could be improved is through kegging to minimize oxygen pickup. The only things I might try when I get around to brewing this one again is to increase the bittering charge just a bit more, and then I’d like to eliminate the 5 minute additions. I’m not sure whether they really add anything substantial that I can’t get from the hopstand, and I’d love to try and cut the cost of this beer a little since those hops add up in a hurry. This beer is just crazy good though, and I wouldn’t change anything else! 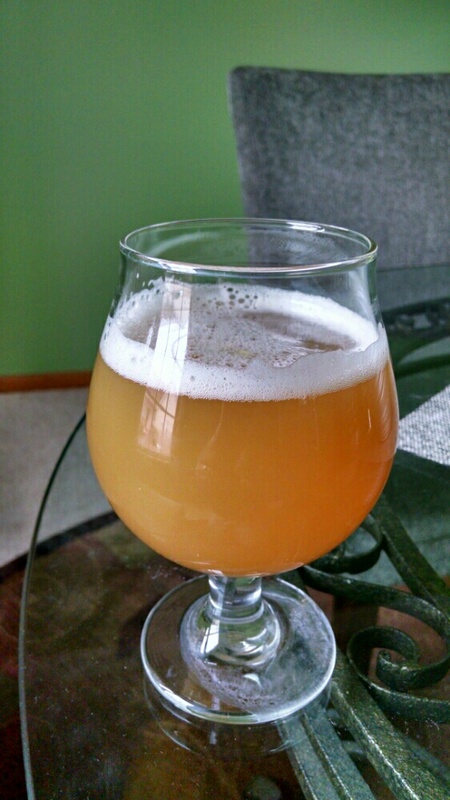 This entry was posted in Recipes and tagged DIPA, Double IPA, Hoppy, IPA by White Pointer Brewery. Bookmark the permalink.